Here is part two of my comparison of some of Goethe’s maxims and the wisdom of Charlie Munger. Johann Wolfgang Goethe (1749 – 1832) was a German writer and statesman while Charlie Munger, born 1924, is best known for his financial wisdom and partnership with Warren Buffett. Risky Thought Processes Thinking by means of analogies is not to be condemned. Analogy has this advantage, that it comes to no conclusion, and does not, in truth, aim at finality at all. Induction, on the contrary, is fatal, for it sets up an object and keeps it in view, and, working on towards it, drags false and true with it in its train. I have a name for people who went to the extreme efficient market theory—which is ‘bonkers.’ It was an intellectually consistent theory that enabled them to do pretty mathematics. So I understand its seductiveness to people with large mathematical gifts. It just had a difficulty in that the fundamental assumption did not tie properly to reality. Dangers of Boredom and Gambling Humanity is conditioned by needs. If they are not satisfied, men become impatient; and if they are, it seems not to affect them. The normal man moves between these two states, and he applies his understanding — his so-called common-sense — to the satisfaction of his needs. When his needs are satisfied, his task is to fill up the waste spaces of indifference. Here, too, he is successful, if his needs are confined to what is nearest and most necessary. But if they rise and pass beyond the sphere of ordinary wants, common-sense is no longer sufficient; it is a genius no more, and humanity enters on the region of error. I knew a guy who had $5 million and owned his house free and clear. But he wanted to make a bit more money to support his spending, so at the peak of the internet bubble he was selling puts on internet stocks. He lost all of his money and his house and now works in a restaurant. It’s not a smart thing for the country to legalize gambling [in the stock market] and make it very accessible. Avoid what you Don’t Understand What a man does not understand, he does not possess. A man has only to declare himself free to feel at the same moment that he is limited. Should he venture to declare himself limited, he feels himself free. If you can’t understand it, don’t do it. Avoid Envy and other Negative Emotions Hatred is active displeasure, envy passive. We need not wonder that envy turns so soon to hatred. Envy is the only sin you can’t have fun at. Resentment is crazy. Revenge is crazy. If you get those things out of your life early, life works a lot better. Ignore Criticism Against criticism a man can neither protest nor defend himself; he must act in spite of it, and then criticism will gradually yield to him. Acquire worldly wisdom and adjust your behavior accordingly. If your new behavior gives you a little temporary unpopularity with your peer group…then to hell with them. Learning from Fanatics I went on troubling myself about general ideas until I learnt to understand the particular achievements of the best men. Invert The greatest difficulties lie where we do not look for them. Some men think about the defects of their friends, and there is nothing to be gained by it. I have always paid attention to the merits of my enemies and found it an advantage. Invert, always invert: Turn a situation or problem upside down. Look at it backward. What happens if all our plans go wrong? Where don’t we want to go, and how do you get there? Instead of looking for success, make a list of how to fail instead–through sloth, envy, resentment, self-pity, entitlement, all the mental habits of self-defeat. Avoid these qualities and you will succeed. Tell me where I’m going to die so I don’t go there. No Short Cuts If you miss the first button-hole, you will not succeed in buttoning up your coat. If you missed Part 1 I think you will find it enlightening as well. 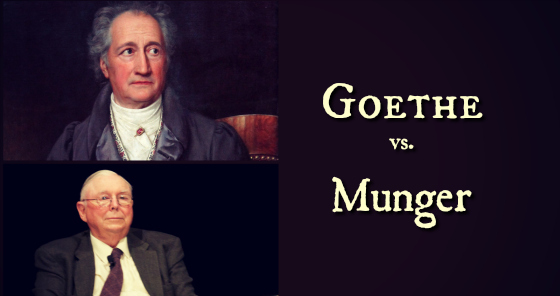 Did you ever compare or contrast the likes of Charlie Munger and Johann Wolfgang von Goethe? Is there someone else that you would consider equally engaging that I should consider for a future blog? I’m interested in your feedback.